Saturday evenings, we visit our local comic book shop for board game night. This evening, we played a game called Taboo. To play the game, a minimum of four players must split into two groups. One player on the team draws a card that the player must use to give hints to the others on his/her team so that they can guess the word at the top of the card. The clue giver cannot use the word or any parts of the word. 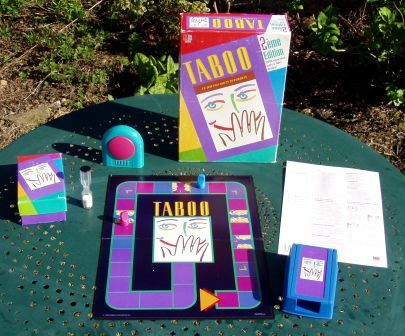 In addition, the card lists five or six related words that are taboo, meaning that the clue giver must avoid using those words in their hints as well. Guessing the word will score the team a point; however, if the clue giver uses a taboo word, the team loses a point. A short timer allows the team to guess as many cards as they can in the time limit, then the other team gets a chance to score points. Take a look at something you recently wrote. Try removing “to be” verbs from your writing and compare the before and after. Did you find that making these changes paints a more colorful story? I typically do.